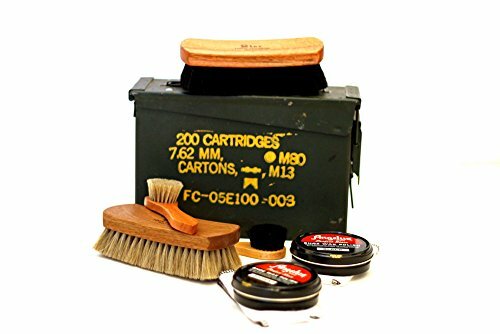 Everything you need to keep your footwear looking great packed in an authentic military 30 cal. ammunition can. These Ammo Cans are the real deal and have been used in the field. They can have dents and scratches that give them a rugged and well worn look. It's a great gift for the military man, or for any guy who takes pride in keeping his shoes and boots shined to perfection. It will last forever and make a statement about the guy who owns it.